Experience King Lear as a powerful full-cast drama with entertaining and enlightening commentary that explains what's what and who's who as the plot unfolds. This was an excellent production of King Lear. The download includes two files, one with commentary throughout and a second file that is the play without commentary, allowing the listener to decide how much explanation is desired. I listened with the commentator and she does a great job of setting the scene before the play begins, provides a good overview of Shakespeare and his time period, and then provides a expert "translation" of the text. This series would be especially helpful to those studying Shakespeare in school. I listened to this in conjunction with Bill Bryson's book Shakespeare. I am not a Shakespeare-nut. The format with an involved narrator made all the difference for me. The characters and background noise make it fun, the narration sets the location and explains the details. My husband and I listened together to this annotated Lear in preparation for seeing it this summer. We liked it very much. One might argue that it is a little childish to have an explanation of the plot after every few lines, but it really helped us keep track of everything and to grasp, for example, all of the Fool's innuendos. We have loved the play a long time but the lively (if occasionally slightly overwrought) explanations between the lines put it into historical context and made it accessible to me in a whole new way. I recommend it. I was initially worried that the "Shakespeare appreciated" series would dumb the play down. However, after listening to their production of King Lear, I am very enthusiastic about the project. I especially appreciate that the guide doesn't stick to only explaining archaic terminology, but also notes many of the more subtle themes that run through the play and describes how specific passages advance these undercurrents. The addition then-contemporary references and allusions to then-topical events and scandals is a nice touch. The guide's relatively frequent interjections and scene analysis was helpful even beyond their informative content, as they made it much easier to follow which characters are active in a given scene. Otherwise, you have to remember fairly subtle voice differentiations - difficult if you are listening to the play in moderate intervals. I appreciate that the file seems to have both annotated and non-annotated readings. The commentary does its job, which is to explain in simpler language what might be hard to understand in the original text of the play. I thought the narrator was too overexcited about every single scene. Her lively tone of voice seemed more appropriate for a naturalist talking excitedly at the camera as she comments on gorillas in the wild doing unusual things right next to her. Not enough to irritate me, but I feel some people might either love or hate it. As for the actors voices in the play, it's not like the Royal Shakespeare Company live, but it's good enough for me. You can either listen to the actors performing the text (with the perky narrator giving you the stage directions), or listen to the actors followed by explanation/interpretation of the text that was just performed. I don't know how it compares to similar audiobooks, but I think the this particular audiobook is meant for school or university students who'd like to understand what's going on in the play. I love Shakespeare Appreciated!! The commentary adds so much to the understanding of the play!! I do enjoy listening to the second half— that has no commentary. The narration by both the commentator and the actors is very well done! King Lear In All Its Nuanced Brilliance! As someone who has spent a greater part of my life working in theater, studying and working on many Shakespeare productions, this is by far the best means to access this complicated and dark play. First, the production of the text is outstanding, and then the annotation of the text, literally line by line, is extremely enlightening. Making it very, very simple to understand. It has taken one of my favorite Shakespeare plays and made it even greater. I gained a lot of new insight into this text that I had overlooked before. It will be greatly enhanced if you download or read along in the text with them as they go. 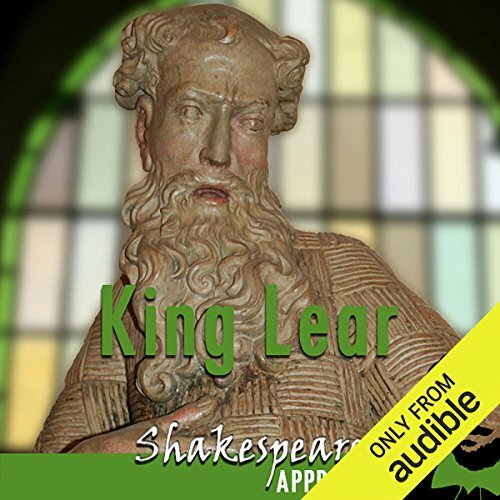 What made the experience of listening to King Lear the most enjoyable? A powerful drama made more enjoyable through the "appreciated" method of explaining the lines in play-by-play fashion. I wish more classics were presented this way. Loved it, great play. Explained well enough for someone who knows very little, but also intriguing for others. Great casting, very happy.